Bubble rainbows with people inside. Audience members making volcano bubbles! Gigantic bubbles that blow their own bubbles? See the newest, funniest, zany spectacular from world-famous, Guinness Book of World Records-holding, master bubble wrangler Jeff Boyer, as he takes bubbles to the max with big bubble flair. 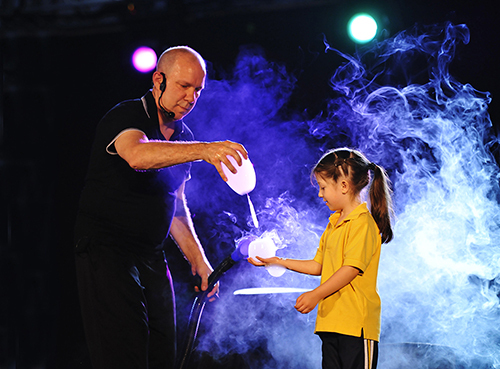 Mixing comedy, music, and interactive bubble-magic, Jeff engages and delights audiences of all ages.